Version and the build numbers work together to uniquely identify a particular App Store submission for an app. The conventions for how these numbers work together are verified by automatic processes when you submit your app to the App Store or Play Store, so understanding how these numbers work and how they are intended to be used will help you save time when submitting your app. In this article we can learn how to get App Version and build numbers through programming. Version and the build numbers work together to uniquely identify a particular App Store submission for an app. The conventions for how these numbers work together are verified by automatic processes when you submit your app to the App Store or Play Store, so understanding how these numbers work and how they are intended to be used will help you save time when submitting your app. In this article, we can learn how to get App version and build numbers through programming in Xamarin.Forms. For each new version of your app, you will provide a version number to differentiate it from previous versions. 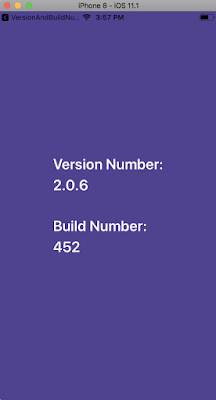 The version number works like a name for each release of your app. For example, version 1.0.0 may name the first release, version 2.0.1 will name the second, and so on. When submitting a new release of your app to the App Store or Play Store, it is normal to have some false starts. You may forget an icon in one build, or perhaps there is a problem in another build. As a result, you may produce many builds during the process of submitting a new release of your app to the App Store or Play Store. Because these builds will be for the same release of your app, they will all have the same version number. But, each of these builds must have a unique build number associated with it so it can be differentiated from the other builds you have submitted for the release. The collection of all of the builds submitted for a particular version is referred to as the 'release train' for that version. In iOS, the version number and the build number are also displayed in your app's Info.plist file. In Android, we can see the version and build numbers in the Manifest file. Let's start to get app Version and Build numbers through programming. Create an interface, IAppVersionAndBuild.cs, with the methods declaration of GetVersionNumber and GetBuildNumber. Now, call dependency service in the code behind for getting Version and Build numbers, also assign those values to the labels. Create a class, VersionAndBuild_Android, and implement the IAppVersionAndBuild methods like below. Create a class, VersionAndBuild_iOS, and implement the IAppVersionAndBuild methods like below. CFBundleShortVersionString, CFBundleVersion these or the Core Foundation Keys in iOS. The Core Foundation framework provides the underlying infrastructure for bundles, including the code used at runtime to load bundles and parse their structure. As a result, many of the keys recognized by this framework are fundamental to the definition of bundles themselves and are instrumental in determining the contents of a bundle.